Whether to attract applicants, save on utility bills, or help the planet, colleges around the U.S. have been ramping up their efforts to go green. 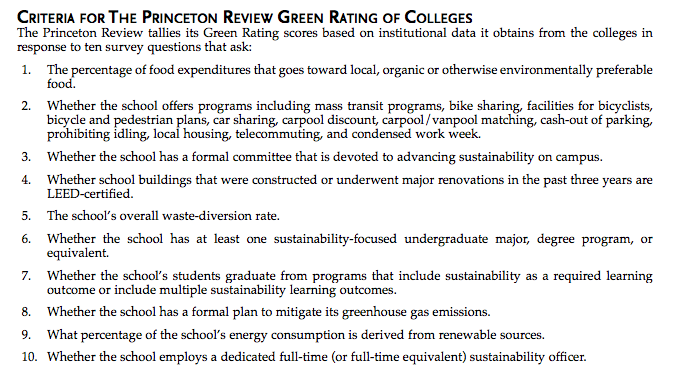 The Princeton Review’s Guide to 332 Green Colleges is a testament to how many schools have shown a commitment to sustainability on their campus. Princeton Review partnered with The United States Green Building Council (USGBC) to make this list. The USGBC is a national non-profit organization known for developing the LEED green building certification. The USGBC also launched its Center for Green Schools in 2010. This center was created to help schools design and build sustainable campuses. The Review is a list of 332 colleges with impressive energy efficient campuses, locally sourced food, and LEED certified buildings. For each school there is a general overview, and then there is a section called “Green Highlights”, which describes the most impressive energy or sustainability initiative for that school. The profile also includes “Green Facts” such as recycling programs, emphasis on environmental studies, and green jobs career advise. The process to get onto the list is competitive and based off of survey questions about the campus and how it operates. Figure 2 shows the questions each school answers to get rated. A great example of a highly rated green college is Columbia University. Columbia, located in one of the biggest and most densely populated cities in the world, has thrived in evoking change on campus and in the surrounding area. They launched NYC Urban Technology Innovation Center to promote green building design in New York. They have an Urban Design Lab that combines the architectural and engineering schools to work on local environmental design and sustainable economic development. Despite their urban setting, which makes constructing a green campus difficult, Colombia’s 17-acre campus is LEED Platinum. They also have devoted effort to source food from local green markets and vegetative roofs. For academics, there are 24 degrees in environmental studies and 33 environmental research centers. There are organizations like Earth Institute and Columbia Eco-Reps that contribute to environmental movements on campus. The list goes on and this is just one example. It is important that colleges are making such an effort to promote sustainability and clean energy because of the influence they have. Institutions of higher education train the leaders of the next generation. If they are promoting sustainability principles, then the next generation will have the initiative and skill set to tackle the world’s environmental issues.